You may wish to read an introductory page first. 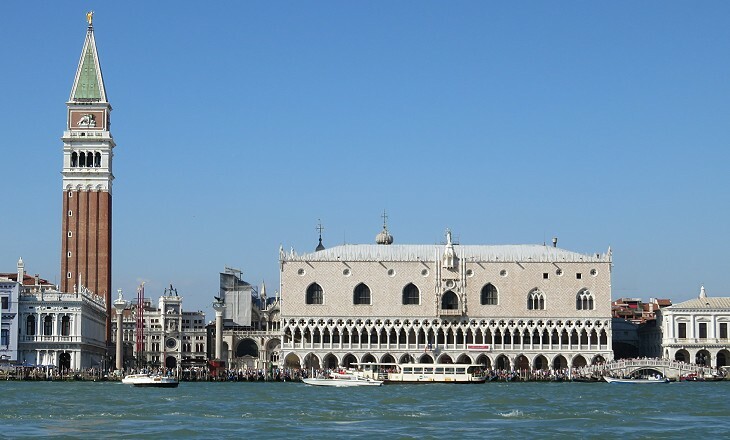 The Republic of Venice developed a naval military power to protect and expand its trade. For centuries it fought with Genoa for the control of trade routes; after the fall of Constantinople in 1453, Venice made use of its powerful fleet to delay and contain the Ottoman expansion. Venice naval strength lay in its well protected Arsenale, a large dockyard where ships, weapons and ammunition were made: it is located in a district called Castello (castle); actually the dockyard has the appearance of a fortress, with walls and high towers. Both the land and the sea entrances to the dockyard have an elegance which is unusual in a military establishment. This is partly due to the fact that they were built about 1460 and were not upgraded to the needs of cannon warfare which required thick walls and bastions. The great 1571 victory over the Turks at Isole Curzolari was celebrated by an unusual Lion of St. Mark: the book with the inscription promising peace is closed and the lion looks quite angry: the battle is usually referred to as the battle of Lepanto, but the Venetians who had in-depth knowledge of the battlefield were more precise and made reference to some islets next to which the actual fight took place. The conquest of Morea (Peloponnese) was celebrated by a bronze column dedicated to Francesco Morosini, who led that campaign. It was the only war with the Ottomans (out of seven) which did not end with Venice surrendering some territories in order to reach a peace agreement. Arsenale now belongs to the Italian Navy and access to it is forbidden; the monuments to General von Schulenburg (who commanded the 1716 defence of Corfu) and to General Konigsmarck (the leader of the troops during the conquest of Morea) can only be seen at a great distance. The entrance to Arsenale is guarded by a gigantic statue of a lion: it is one of the last Venetian trophies of war: it stood at the entrance of Piraeus, which was then called Porto Leone: Francesco Morosini brought it to Venice to celebrate his conquest of Athens. A few years later a smaller lion from Delos was placed at the other side of the entrance. In 1537 the Ottomans vainly tried to seize Corfu, but in the next year they defeated a Christian fleet near Preveza; the naval supremacy gained by the Ottomans meant that all Venetian territories were at risk and even Venice needed better fortifications. Michele Sanmicheli, a military architect, designed Forte S. Andrea and eventually he developed plans for improving the fortifications of Candia and other Venetian possessions in Greece and along the Adriatic coast. Sanmicheli built Forte S. Andrea, a maritime fortress, on an islet facing the main access to the lagoon: cannon batteries were located at sea level to hit enemy ships below their floating line. Sanmicheli did not forget he was a Renaissance architect and the main bastion of Forte S. Andrea shows it. Sanmicheli strengthened the castle which already existed on Lido, a long coastal island opposite Forte S. Andrea; in case of need a chain closed the narrow passage; Forte S. Nicolò, the new fortress, was partly dismantled in the 1930s, but it is still used by the Italian Army and the old barracks house a recruit training centre. The management of the fortifications was entrusted with ten officers (Consiglio dei Dieci). In addition to the chain which closed the passage, some barges carrying cannon were moored inside Forte S. Nicolò: in case of attack they could be placed behind the chain to supplement the artillery of the forts. As a matter of fact the Ottoman fleet never attempted to reach Venice. Forte S. Nicolò was the site of the last military event of the Republic of Venice: in 1797 its cannon bombed a French ship trying to enter the lagoon: the commander of the fort was from Cattaro (Kotor), a port in today's Montenegro, whose inhabitants were among the most loyal ones to the Lion of St. Mark. The coat of arms of Cattaro shows three open mouths because the port is located at the end of a fjord with three entrances one after the other. Venice has several palaces and monuments decorated with military insignia or other references to the wars fought against the Ottomans. S. Maria del Giglio is a sort of summary of Venice at war. The church was rebuilt with the money left by Antonio Barbaro, a member of a prominent Venetian family who played a major role in the 1656 campaign against i Castelli, the Ottoman fortresses protecting Constantinople; another Barbaro (Jacopo) fell in 1650 in an attempt to conquer back Sittia. Antonio Barbaro detailed in his will how the church was to be decorated: he is portrayed at the centre of the façade in his uniform as Capitano del Golfo, the admiral of the Adriatic Sea fleet: in the lower part there are reliefs with the maps of Candia, Corfu and other towns, while other reliefs show Venetian ships chasing the Ottoman ones. In 1799 Pope Pius VI died in Valence, while he was prisoner of the French; although soon after the pope's death the French had to leave Rome, the cardinals thought it better to meet in Venice which at the time was an Austrian possession. The conclave took place in the monastery of S. Giorgio Maggiore, which granted appropriate isolation. Maybe the cardinals enjoyed too much the location because it took them four months to reach agreement on the election of Cardinal Barnaba Chiaramonti, Pope Pius VII. "For this evening I had made arrangements to hear the famous singing of the boatmen, who chant verses by Tasso and Ariosto to their own melodies. This performance has to be ordered in advance, for it is rarely done and it belongs, rather, to the half-forgotten legends of the past. The moon had risen when I took my seat in a gondola and the two singers, one in the prow, the other in the stern, began chanting verse after verse in turns. (.) The singer sits on the shore of an island, on the bank of a canal or in a gondola, and sings at the top of his voice - the people here appreciate volume more than anything else. His aim is to make his voice carry as far as possible over the still miror of water. Far away another singer hears it. He knows the melody and the words and answers with the next verse. The first singer answers again, and so on. Each is the echo of the other. They keep this up night after night without ever getting tired." (J. W. Goethe - Italian Journey - translation by W. H. Auden and Elizabeth Mayer - Collins). ".. I ordered a drink to be brought out to me on the terrace overlooking the canal, and settled down there to watch the sunset, while from a boat that had stopped in front of the hotel a musician sang O sole mio. (.) My mind ...was entirely occupied with following the successive phrases of O sole mio, singing them to myself with the singer, anticipating each surge of melody, soaring aloft with it, sinking down with it once more... Each note that the singer's voice uttered with a force and ostentation that were almost muscular stabbed me to the heart ... Thus I remained motionless, my will dissolved." (Marcel Proust - In Search of Lost Time - The Fugitive). Moving from the verses of Ariosto and Tasso to O sole mio and eventually to Marina does not match the common belief that mankind is always making progress.